Cardiff Reef is located in the South Coast region of California, at the south end of Cardiff State Beach. This site is on the border of the Swami's State Marine Conservation Area, and is near the Cardiff Reef Mussel Watch site. This site is roughly 1.7 km south of the entrance to San Elijo Lagoon, and is about 100 meters south of a large beach parking lot. 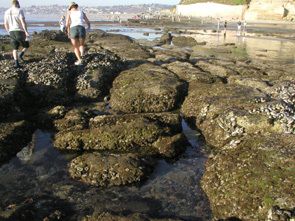 This site receives a high number of visitors, including tidepoolers. This gently sloping site consists of moderately uneven terrain, containing relatively few large crevices and folds. Cardiff Reef is dominated by a mixture of consolidated sedimentary bedrock and sandy beach, and the area surrounding the site is comprised of a mixture of cobble/gravel fields and sandy beach at this site. Sand can fluctuate by more than one meter in less than a year at this site, resulting in a heavily scoured site. The primary coastal orientation of this site is west. Long-Term MARINe surveys at Cardiff Reef were established in 1997, and were previously done by University of California Santa Barbara, but are currently done by Cabrillo National Monument. Long-Term monitoring surveys currently target the following species: Chthamalus/Balanus (Acorn Barnacles), Pollicipes (Goose Barnacle), Mytilus (California Mussel), Red Algal Turf, Phyllospadix (Surfgrass), and Pisaster (Ochre Star). Click here to view Long-Term trends at this site.